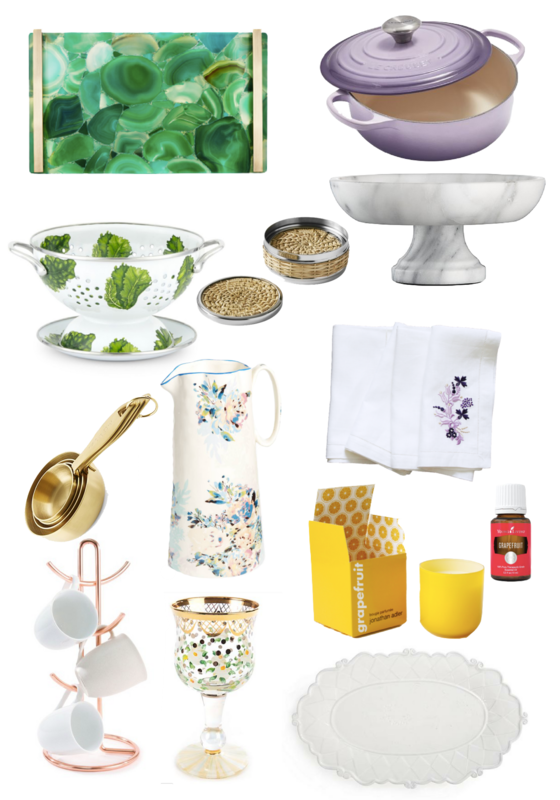 Since my wish lists are usually fashion-focused, I thought I’d mix it up a bit this week and do more of a home, specifically kitchen and tabletop, version! I’m feeling really inspired this Spring to do a few more things around our house to finish projects that I’ve half-started and also to just add some color and seasonality to our decor. As far as color is concerned, I’m clearly leaning toward purples and greens for home right now> I saw this Le Creuset Dutch Oven on the cover of a catalog a couple of weeks ago and just loved it. The pieces we have are a really pretty blue but I think this one would coordinate really well with it! The Le Creuset pieces are definitely an investment but for me they’re completely worthwhile. They cook everything so evenly and we use ours at least 1-2 times per week. For tabletop, I love the new Sweetbriar pieces from Mackenzie Childs. This white platter is great for spring entertaining (and will go EASILY with whatever you have already) and how pretty are the wine glasses with gold and flowers? I just think they’re so feminine and spring-y. I think I need to start my collection of them ASAP. Also, in my Peloton groups, I’ve heard amazing things about this Jonathan Adler Grapefruit Candle. Apparently it’s what they burn at the SoulCycle studios and everyone raves about it. You can get it, but it’s not easy to find and it’s backordered. In the meantime, I think I’m going to pick up this Grapefruit Essential Oil and diffuse that (any recommendations on a floral to mix it with?) around our house.